Last month, I was lucky enough to go to NYC for work (and some play). Unlike last year’s trip where I didn’t get to eat anywhere fun, this year I ate more than my fair share. And I finally got to visit Momofuku Milk Bar! As well as Levain Bakery, Bouchon, and Jacques Torres (chocolate covered Cheerios anyone?). And oh yeah, I also ate lots of carbs at A Voce, Trattoria Dell’Arte (fried artichokes, mmm, thank you Elana! ), and Bistro Milano. And while I did not make it to the Halal cart even though it was right across the street from my hotel, it’s fair to say I did not go hungry during my trip. I may have fallen in love with Momofuku Milk Bar. I came back to LA and told everyone how awesome the bakery is, gushing about the peanut butter pretzel caramel pie, and about their amazing cookbook. Then a few weeks later, the cookbook was MINE. 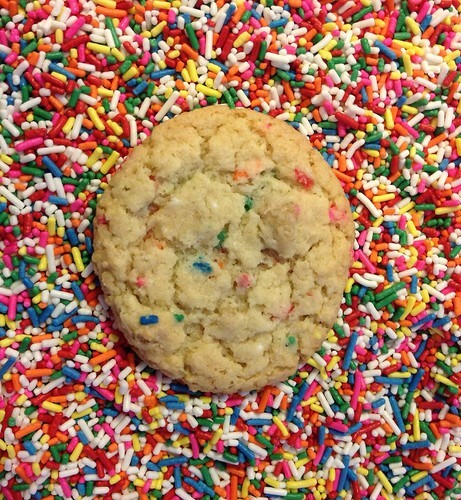 I poured over the pages and immediately decided I had to make the Confetti Cookies because really, what’s better than fun and colorful cookies to bring into the office the first day back after a long weekend? Right out of the oven, these cookies reminded me of the sugar cookies my sister and I used to make with our mom when we were kids. But the next day, they grew on me. They’re chewy inside, with a slight crunch on the outside, and the pieces of the birthday cake crumbs are delicious. While not my favorite cookie ever, they’re fun and were a huge hit at the office. Side note: this cookbook has weight measurements which are AWESOME. Less dishes to wash and more accurate measurements. If you don’t have a kitchen scale, get one now! Spread the clusters on a parchment or Silpat lined sheet pan. Bake for 20 minutes, breaking them up occasionally. The crumbs should still be slightly moist to the touch; they will dry and harden as they cool. Let the crumbs cool completely. Stored in an airtight container, the crumbs will keep fresh for 1 week at room temperature or 1 month in the fridge or freezer. Still on low speed, add the birthday cake crumbs and mix in for 30 seconds—-just until they are incorporated. Using a 2 3/4-ounce ice cream scoop (or a 1/3-cup measure), portion out the dough onto a parchment-lined sheet pan. Pat the tops of the cookie dough domes flat. Wrap the sheet pan tightly in plastic wrap and refrigerate for at least 1 hour, or up to 1 week. Do not bake your cookies from room temperature–they will not bake properly. Arrange the chilled dough a minimum of 4 inches apart on parchment or Silpat lined sheet pans. Bake for 18 minutes. The cookies will puff, crackle, and spread. After 18 minutes, they should be very lightly browned on the edges (golden brown on the bottom). The centers will show just the beginning signs of color. Leave the cookies in the oven for an additional minute or so if the colors don’t match and the cookies still seem pale and doughy on the surface. Recipe from the Momofuku Milk Bar cookbook. I think my husband needs these. He loves birthday cake in pretty much every iteration! And well, the inclusion of sprinkles means I can tease him about jimmies.